I am back from vacation but need a few days to see what’s going on and get back into the swing of things so another rerun for you all. 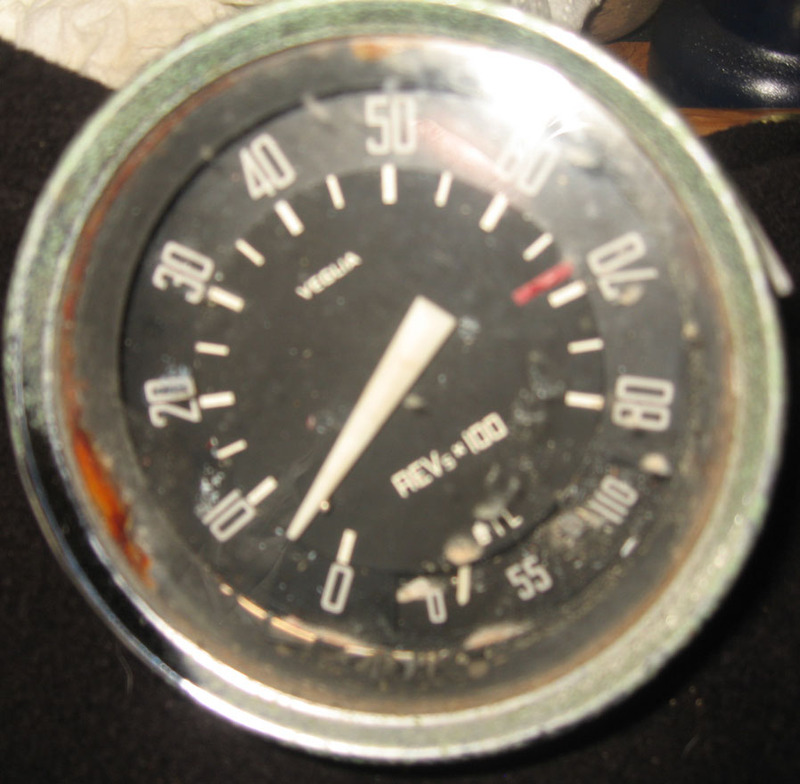 Originally posted 7/28/09: Following on my success with the Super gauges intended for my TI and the two Sprint Speciale gauges, I decided tackling the last gauge for the SS was the thing to do yesterday when I spent some hours at the shop. I would probably have paid $40 for this on eBay and been disappointed when I received it if I didn’t know then what I know now. Needles are pointed where they belong but other than that it looks bad. At least the plastic insert is not yellowed. I have to fess up. I started this blog post yesterday and then chickened out and stopped working on it because I felt a little embarassed by the quality of my work. I feel like the rust repair is going okay, the metal is responding, but the finished product looks pretty marginal. Good enough -yes, but I sort of imagined some unknown talent taking over and this coming out nicely. I am aware that this is sort of how these things go, and skill development takes time but it’s hard to not get discouraged. Oh well. Good enough indeed. Picking up where I left off last time. Bumper mount recesses and tubes are removed and cutouts for back up lights are, well, cut out. It’s reassuring to know that people exist who can undo all my efforts and make it right if someone wanted it so and money was available. 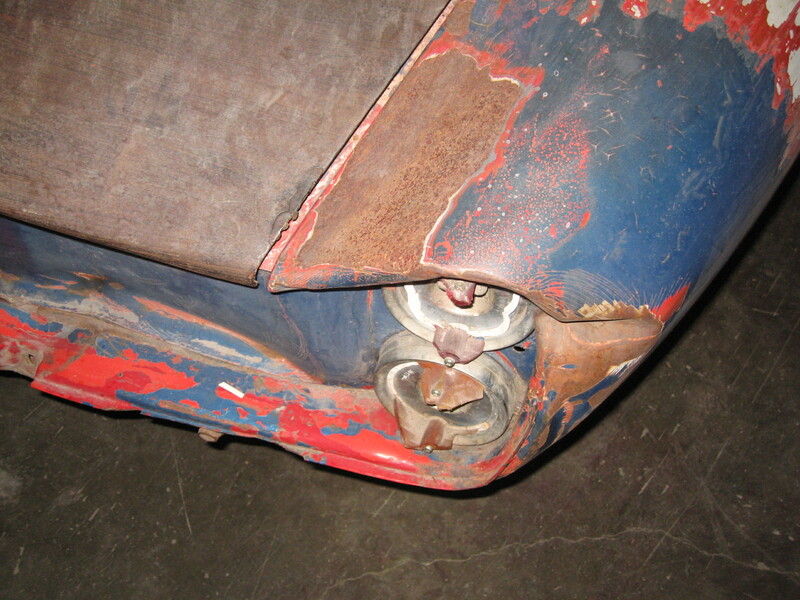 It was nearly 2 years ago that I started work on this corner of the car -was the first body work I attempted. Back then I didn’t really know what to do about some of the problems I faced, but as with all things, I figured when it came time to make a decision, I would somehow know what to do. 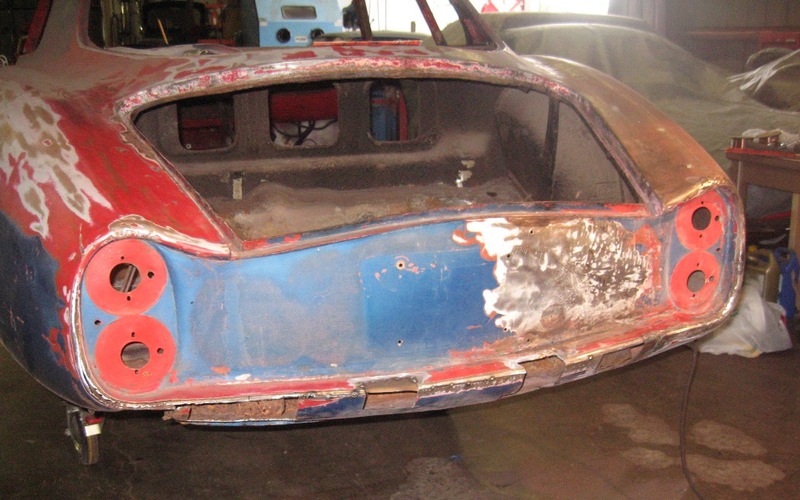 The bodywork was tweaked just enough in a crash, and rusted through in just enough places that getting it back to stock was going to be difficult. Now that I am welding and unafraid and have to deal with it, I have decided to repair it by emulating the early lownose rearend -a much simpler design and hopefully easier to fabricate. Check it out. A reminder of where I started and what I started with. Now that I have experience I can tell you the dent to the left of the tail lights, in the gentle curve of the Kamm tail area is a harder thing to deal with than the edge chop. The title of this one has become my mantra. Welding is getting easier incrementally, as is shaping the metal. As I cut little areas open, remove the dead metal and add new in I am always telling myself to just get it good enough so I can grind it down, smear the weld with all metal filler, sand that down and hide any imperfections under some polyester filler. Here is the latest. This picture was taken about 2 hours before I sat down to write this. You can’t really see much of the improvement, but this is what it looked like when I left tonight. I’m only looking forward to the sanding and filler stage because it will mean the welding stage is done. Did I mention welding is dirty work? I got to the shop early this morning to continue some work I started Friday after work-painting most of the inside of the front end with rust encapsulating chassis paint. I finished wire-wheeling all the crud and everything off the engine compartment surfaces, the insides of the fenders etc and it had been sitting for about a week and surface rust had begun to form so it was time to seal it. Check it out. Another giant leap. All it took is the happy convergence of a few things namely: a rudimentary understanding of welding, the realization that ‘good enough’ is good enough, and, well if it comes out total crap I can just cut it all out and try again -it’s only my time after all. So what did I do with my new found intrepid spirit? I welded that headlight area back on that I cut off about 18 months ago. I didn’t have my camera through most of the hard part, but it looked a lot like the work I did in the rocker -rough, nasty and strong. Near the finale. I tried the headlight rings on to see how it looks. It looks okay, but if I measure with a straight edge, the plane of the two headlight rings is not parallel one side to the other. The outer edge is about 1/4″ too far out. I may regret not taking it to a professional at some point but I just can’t bring myself to let someone else do this job. The whole point of this exercise -restoring the SS- was to learn a bunch of skills and see what I could do. So, in that spirit I put on my grubby work clothes, got out the serious metal-cutting tools and went for it before I had time to turn back. Friday afternoon I got to the shop at about 430. I have been looking at this rusty mess since before I received the car and it struck me at that moment -now was the time to fix it. Under that rust hole is the support for the door, a sort of cup. Fortunately it is VERY solidly attached and I just need to work around it.